Through hands-on experiences and interactive classes, campers learn elements of leadership that enhance their ability to make valuable contributions to their families, teams and communities. Camp Challenge introduces and reinforces the values of honor, integrity, respect, responsibility, compassion, and gratitude at the highest level. Camp Challenge LET is the Academy’s summer leadership development program, established in 2010. It is the only Junior Reserve Officer Training Corps (JROTC) credit-producing summer leadership course west of the Mississippi. Summer Cadets learn to focus on achievement as they work to overcome physical and mental team challenges while developing self-confidence as leaders and contributing team members. Specifically designed for high school students, our JROTC Camp Challenge course will reward successful participants with 180 hours of Leadership Education and Training. During our four-week course, participants will develop self-confidence as leaders and as active team members. In the second level of the LET program Summer Cadets focus on more advanced citizenship skills while continuing their development as self-confident team members. Building on their LET I experience, LET II Summer Cadets take part in health and first aid instruction designed to promote wellness through nutrition, physical fitness, and substance abuse prevention. Camp Challenge LDP is for Middle School Summer Cadets who are just beginning to explore their leadership potential or interest in JROTC. The camp includes formal leadership instruction in addition to "Foundations of Success" subject matter. Summer Cadets will attain invaluable life skills, including self-confidence, team-building, accountability, discipline, and respect. This "Introduction to Leadership" camp is for middle school campers interested in exploring their leadership potential and enhancing existing leadership skills while learning the fundamentals of citizenship. 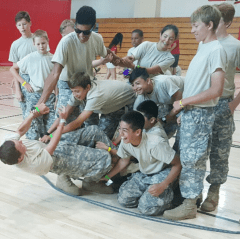 LDP Summer Cadets pick up invaluable life skills through fun activities and adventure-based challenges that reinforce teamwork, accountability, discipline, respect, and other traits, setting their foundation for success. Available only to Summer Cadets that have completed the required LDP Basic course, this level of LDP consists of a more advanced curriculum in leadership combined with an introduction to subjects that will help prepare campers for high school. As with all Camp Challenge camps, LDP Advanced focuses on the Core Values of Honor, Integrity, Responsibility, Loyalty, and Selfless Service. For Summer Cadets interested in the opportunity to complete basic and advanced courses, this "Combination" option provides both during the four-week session. Visit our Facebook to check out camp photos! Questions? Contact Michael Basista by email or at 760.547.5288.